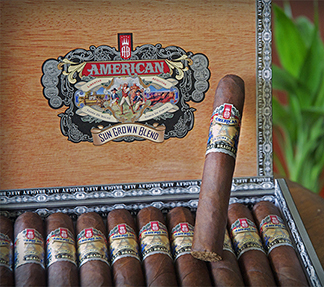 A welcome addition to Alec Bradley Cigars "American" brand is the American Sun Grown Blend cigar, which is a bolder, spicier version of the company's very popular American Classic cigars. Similar to the American Classic, the Sun Grown Blend has specially-aged Nicaraguan Esteli and Condega long-fillers and Nicaraguan Jalapa binder at its core, but the dark and oily wrapper is a sun grown Habano leaf from Jalapa, and it brings on the spice. This medium- to full-bodied cigar offers up a complex and flavorful smoke with rustic notes of sweet cedar, roasted nuttiness, espresso, and pepper. Alec Bradley has succeeded yet again in blending a very enjoyable premium handmade cigar at an affordable price.